Try to Cook on Coals! 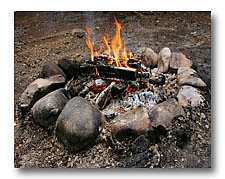 Once your campfire burns down you can cook on coals directly. Use the direct heat of coals to cook food without any other dishes or equipment. Some foods are most delicious cooked directly on hot coals. Here are a few suggestions for cooking your camping food directly on the coals. These are only ideas. Use your imagination to think of other foods that would do well cooked directly on hot coals. Tip: Hardwood coals are best for direct contact with food. Place a slice of bread directly on white glowing coals. After about a minute, turn the bread to brown the other side. Remove from heat and blow the ashes away. Butter and enjoy! Make stiff biscuit dough, then form small flat cakes and place them on a bed of white hot ashes. When they are golden brown, turn them over to cook the other side. Eat with jam or honey for a yummy snack. Fish, steak, or hot dogs can be cooked directly on hot coals. It gives them a tasty flavor much different from other cooking methods. We often use aluminium foil to wrap veggies and place directly on the campfire coals. This method is great for potato, sweet potato, pumpkin. Carefully turn once or twice while cooking and check by poking with a sharp knife to feel if they are soft. Don't leave in for more than about 45 minutes otherwise there may be no veggies left.